Boston signed Jenrry Mejia to a minor league deal on January 30 after he was reinstated for the 2019 season. Mejia is most known for becoming the first and only player to receive a lifetime ban from Major League Baseball for steroid use as he failed three drug tests between April 2015 and February 2016. He also served as the Mets closer in 2014, earning 28 saves. 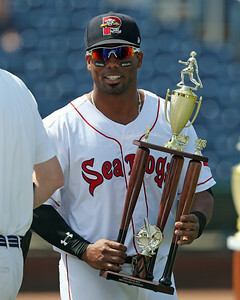 Aneury Tavarez (pictured, right) will be returning to the system as he signed a minor league contract on January 26. Brian Ellington and Dan Runzler also were inked to minor league contracts on February 1. Yorberto Mejicano, an 18-year-old catcher from Venezuela, signed as an international free agent on January 10. He stands at 5-foot-11, 185 pounds. The Red Sox started trimming rosters in advance of Spring Training throughout January, beginning by cutting six players loose on January 16. Jordan Betts was the first casualty of the logjam at the corner infield spots in the upper minors, as he was released after slashing .264/.328/.413 in Pawtucket. 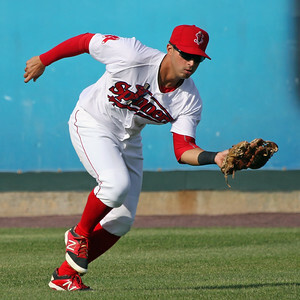 In the initial roster cuts, he was the only player who played above Salem, with Taylor Ahearn, Trey Ganns, Austin Glorius, Lukas Young, and Hansel Viola joining him in the free agent pool. The team also released Johnny Bladel on January 18 and followed with 11 more players on January 20. Carlos Tovar, who hit .222/280/.253 in Salem during 2018, and Ryan Scott, who hit .194/.273/.321 on the same squad, were the only two in the group to have played above Greenville. They were joined by Brayan Aquino, Jose Bens, Ramfis Berroa, Eduard Conde, Alberto Franco, Victor Garcia, Ivan Houllellemont, Juan Morillo, and Jeison Pena. Twelve players, none of whom played stateside, saw their tenure with the Red Sox end the next day in Lewis Baez, Argenis Batista, Luis Colmenares, Juan Crisostomo, Angel Gonzalez, Luis Hernandez, Reuben Hernandez, Ronaldo Pulgar, Gabriel Quintero and Nelson Teran. The SoxProspects podcast made its 2019 debut on January 12, with Chris and Ian hosting Alex Speier of the Boston Globe to have an in-depth discussion on the state of the Red Sox system as well as the future of the front office. Jim Crowell has the latest on the end of organized winter ball with the offseason's final Fall/Winter Roundup (any notes from the Caribbean Series will come via our standard notes columns). Chris Madera (pictured, left) and the Estrellas de Oriente won the title in the Dominican Winter League, while Mayaguez, who counted Jeremy Rivera among its ranks, lost in the championship of the Roberto Clemente Professional Baseball League. The SoxProspects staff also updated some scouting reports, including two top-10 and four top-20 prospects in the system. Triston Casas, Nick Decker, Danny Diaz, Ryan Fitzgerald and Antoni Flores each have new nuggets on their pages, mostly pulled from Director of Scouting Ian Cundall's notes from the Fall Instructional League. New Pawtucket manager Billy McMillon was named an inductee to the International League Hall of Fame on January 29, hitting .310 in over 600 games in the league, grabbing three All-Star nods and two batting titles. Former Pawtucket executive Lou Schwechheimer, who gave 37 years of service to the team after starting as an intern in 1978, was a two-time executive of the year, and was part of the management of teams that won two Bob Frietas awards for Minor League operations during his tenure. WEEI's Rob Bradford detailed how Brian Johnson used his World Series share to pay off his dad's house, as well as another, more fun purchase. Bradford also has the story on Ryan Brasier (pictured, right), who just one year after being signed to a minor league contract after time in Japan is in the conversation to become the closer of the reigning World Series champion. Alex Speier of the Boston Globe highlighted how the team is trying to find more players like Brasier, who were cheap and incredibly effective on the way to raising yet another banner in Boston. Eric Rueb of the Providence Journal was present for McMillon's introductory press conference as manager of the PawSox and has all the details on the unique situation of managing a team that he knows will be moving. Writing for Baseball America, Alex Speier discussed Antoni Flores, who could fill the lack of depth up the middle for the Red Sox system.